Our 2018 season begins the day after Thanksgiving (Friday, November 23). and runs through Monday, December 24. As always, we will have an excellent selection of fresh cut Pennsylvania grown trees. Or if you prefer, you are welcome to cut your own tree. Finally, we have one of our best selection of balled and burlap trees in years. We also have wreaths, swags, greens, holly, boxwood, grave blankets and evergreen roping. Mother Nature, as usual, provided us with numerous challenges. To say this year was wet would be an understatement! In spite of the rain, James managed to plant over 2500 seedlings and transplants this spring which should be your choose and cut trees in 6-10 years!! Our Choose and Cut inventory is starting to improve, with a good selection of Blue Spruce, Norway Spruce and White Pines. Our selection of choose and cut Douglas Firs is still limited, but we hope to improve the amount available in the near future. Because Douglas Firs, as well and Fraser and Concolor Firs are so popular, we bring in a large number of these varieties as fresh cut trees. We will also be bringing in larger quantities of Nordman Firs, which have proved quite popular with our customers. All our fresh cut trees come from either Lehigh or Schuylkill Counties in Pennsylvania. We have brought in the fresh cut trees from the same quality growers for a number of years and they always supply us with beautiful, fresh trees. While at the farm, please visit the barn, where Alice will have large supply of handmade wreaths and other greenery, as well as some hand knit hats, gloves and other items made by Alice and James. YES- WE CAN DRILL TREES FOR STAND-STRAIGHT AND TIM MITCHELL TREE STANDS. For those customers who would like to plant their tree after Christmas, we have a nice selection of hand dug Blue Spruce, Norway Spruce, White Spruce, Engleman Spruce, Serbian Spruce and White Pine. They range in height from 4'-8'. Please note that these trees should only stay indoors for a week to ten days. If you are interested, we will be happy to give you detailed instructions on how to care for a live tree. Come into the barn and find your perfect Christmas wreath, many of them handmade by Alice. You will also find a generous supply of pine and Fraser fir roping, grave blankets, assorted greens, holly and winterberry. And while you are enjoying your complementary warm cider, don't miss the hand knit hats, scarves, mittens and wrist warmers that are created by Alice and James. Christmas season has always been special at Corkum's. It is the time of the year that we welcome the most people to our farm and while it is a lot of hard work, the joy of seeing old friends and happy young children makes it all worth while. Our approach is very low key. We do not offer all the "bells and whistles" that many other Christmas Tree farms do, but we hope that our more laid back style also can be appreciated. We will welcome you, offer you a complimentary glass of warm cider, try to keep the winter mud down to a minimum while offering quality trees and Christmas greenery at fair prices. All of our workers are our own family members or friends who enjoy helping out during the season each year. We look forward to seeing you this season and hope that you will become an annual visitor. -Sorry- We do not allow customers to tag trees in advance. LOOKING FOR A SMALLER TREE OR SHOPPING ON A BUDGET? While we are known for providing premium Pennsylvania grown trees at competitive prices, we also have a nice selection of smaller trees (from Table Top to @ 6') that are priced for budget minded customers. 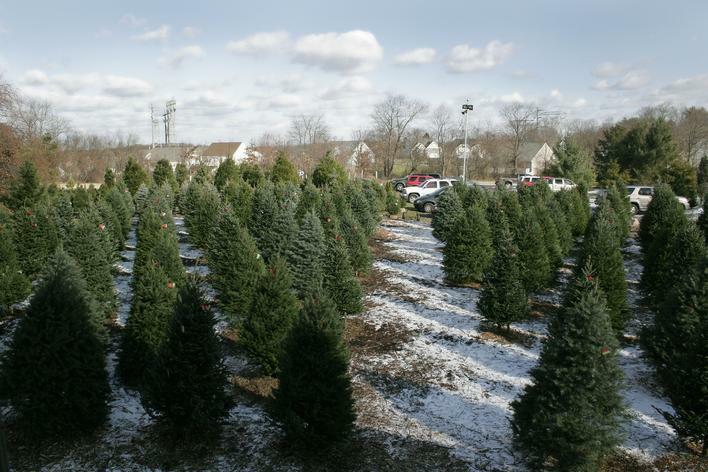 These trees come from our farm or our other PA suppliers and may be more narrow, or more wide or more natural looking than our larger premium trees, but at reduced prices. Visit the Bargain Patch and see if there is a tree there for you!